This was definitely this season’s most difficult episode to review. “Blackwater” was a break from the norm, in that it told a more self-contained story and worked as a climactic season finale. “Valar Morghulis” is, in most respects, a return to the norm. Some developments feel like major turning points and undoubtedly well-suited for a season finale (and we’ll discuss that more later), but like most episodes of “Game of Thrones”, it feels like just one small piece of a much larger story. It’s a lot harder to gauge my personal reaction to something like that. I would say with confidence that “Valar Morghulis” was at least as good as any episode of “Game of Thrones” has ever been. But it isn’t just any episode of “Game of Thrones”. It’s the season finale. I remember being slightly disappointed by the somewhat anti-climactic resolution to the first season, so I tried to temper my expectations when going into this one. It certainly helped that I already had a very satisfying climax to the season in “Blackwater”, so I was ready to accept a much more low-key post-climax finale. For most of its running time, it certainly is a lot more low-key. But that final scene seemed to come out of nowhere and became one of the show’s greatest moments. It may even beat out the Wildfire explosion for the top spot, but I’ll have to let it sink in a while longer before making that proclamation. The scene serves as a fantastic payoff to something that began all the way back in the pilot episode. If it’s not already obvious from reading my reviews, there is probably nothing I wanted more out of the show than to see more of those wonderful White Walkers. And boy, did I get my wish. The sound and visuals in the scene are just tremendous and haunting. I especially loved the bit where Samwell turns and sees the White Walker on the horse, looking right back at him. (By the way, Samwell is totally becoming this show’s “Hurley”, in that he’s the gentlest soul on the show, never loses weight, and is probably invincible.) They really nailed it with this scene. The direction is perfect. The special effects, which seem to be a good blend of practical and CG, work brilliantly. Even Ramin Djawadi’s music seemed to go above and beyond the usual standard. Saving these big, supernatural reveals for very rare moments has made them a lot more powerful than they would have otherwise been. I don’t think a more chilling and unsettling scene exists in the show, so far. I just hope that these zombies turn out to be more interesting than the usual cinematic variety. The White Walkers themselves are awesome, but I hope that these undead people end up being faster, smarter, and more mysterious, like they initially seemed to be back in the pilot and in the episode where Jon had to kill one to save Commander Mormont. I’ve had just about enough of dumb, shuffling zombies. This one brief scene really puts everything into perspective. All this petty conflict between the humans is soon going to seem stupidly shortsighted. What good is power over the human world when it can all be swept away by forces and beings that make mortals seem puny in comparison? This is certainly going to be the most enjoyable part of “A Song of Ice and Fire” for me. I can’t wait to see the mortal world become ravaged by a supernatural cataclysm, full of horrifying monsters and gods. Standing together against this onslaught would be the smartest move, but I sense that that’s not how things are going to go. The episode is 70 minutes long, and even at that length, it still feels like it isn’t allowed to spend quite enough time on each story thread. That said, it does get the job done. And the “job” here is, at least in large part, the re-positioning of characters in preparation for the next season (and future seasons). It’s not precisely clear where everyone is going, but things are definitely changing for just about everyone. Although in at least in one case, things are remaining frustratingly the same. There’s a whole lot to discuss, so I’ll dive right into it. Sansa is getting to be quite ridiculous. She turned down an escape with Sandor Clegane, much to my disappointment. And now, she turns down Petyr’s offer to help her escape, even after discovering that life in the royal court was likely to get even harder if she stayed. Maybe she doesn’t trust Petyr, but from an audience perspective, we know that Petyr is likely to actually follow through on this offer, seeing as how this might earn him favor with his beloved Cat. I never expected Varys to turn out to be such a nice guy. I always grouped him together with Petyr in my mind, as the two have seemed like equally-matched players in the game; each with a healthy mutual respect for one another. But it’s becoming clear that Varys is a very different sort of man from Petyr. In fact, I’m beginning to think that Varys may slightly outmatch Petyr. Varys may not genuinely care about anyone more than himself, but he at least recognizes the value of appearing to care. Season 2 has started to show the cracks in Petyr’s armor. Compare Petyr’s reaction to Tyrion’s scheming to that of Varys. Petyr was infuriated, and let Tyrion know it. But Varys complimented Tyrion. He quickly grew to respect Tyrion, or at least to see the value in befriending him. Petyr uses open threats, while Varys threatens Tyrion by simply making small talk with Shae. And it was Varys that visited Ned in prison, gave him a drink, and gave him some much-needed advice. Varys is simply better at socializing and making friends, which makes sense, given how many spies he has. Petyr is a bit more impulsive and arrogant, and it could soon be the death of him, now that Varys appears to have begun plotting against him. Tyrion’s current situation is the definition of infuriating, but I can’t say that I’m surprised by it. Tyrion rose to an unprecedented height over the course of the season. So it makes sense that he’d be brought back down to Earth again, at least for a while. I can’t imagine Tyrion being very happy anywhere else now, so it makes perfect sense that he’d elect to stay. But it will almost definitely mean the death of Shae, which isn’t going to do any good for Tyrion’s sense of well-being. Arya is yet another person to refuse an offer in the episode. In her case, it’s disappointing, but the door is left very open for her to re-consider in the future. (It also left me to wonder if Syrio might make a return.) I’m actually a bit disappointed that the enigma that is Jaqen H’ghar was explained with magic. It opens up some interesting possibilities, of course (like seeing Braavos), but I preferred to imagine that Jaqen was just an extremely skilled assassin. And the idea that he might be played by multiple actors in the future (assuming that he returns) is an annoyance to me. Still, I’m quite curious to learn more about Jaqen and his powers, if only because it means we might get to see Arya go down that path as well. The Jaime/Brienne pairing continues to be one of the most enjoyable of recent developments. The two of them only get one, relatively short scene , but it’s a good one. Jaime seems to be having a blast trying to get a reaction out of Brienne, but Brienne is like a rock. The fun begins when three Stark men show up, having just murdered three innocent women. Jaime and Brienne do some great cooperative work in trying to hide Jaime’s identity, but it doesn’t work, so Brienne gets to slaughter them and take revenge for the murders. Jaime seems suitably impressed and maybe even a little taken aback. I could see these two becoming unlikely friends. Whether or not that turns out to be the case, I certainly hope we see a lot more of Jaime next season than we did in this one. 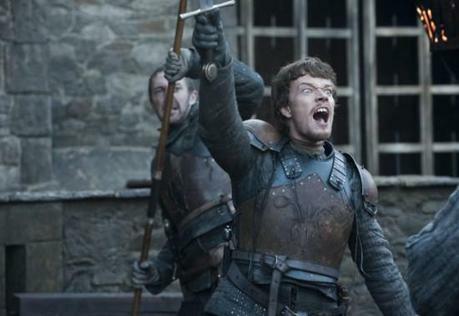 Back at Winterfell, Theon continues to dig himself deeper and deeper into his own hole. The scene between him and Maester Luwyn was a surprise highlight of the episode. That scene did more to explain Theon than anything else before, and I finally found myself feeling truly sorry for him. He’s little more than a troubled young boy pretending to be a man, and now he’s in way over his head. Maester Luwyn seemed to be finally getting through to him, but Theon ultimately decided that death in battle was his only option. Theon isn’t likable at all, but I sympathize with him enough that I don’t wish death on him, despite all that he’s done. It’s the end of the road for Maester Luwyn, though. At first, I was rather disappointed to see him dispatched so abruptly, but thankfully a better final scene was in store for him. His final moments at the heart tree were some of the most emotionally affecting of the entire show. There hasn’t really been a death scene so far that genuinely moved me in “Game of Thrones”. Most of them are simply gruesome and numbing. But Luwyn dies with a big of dignity, and gets to say a heartfelt final farewell to the Stark boys. I liked the hard cut from Luwyn’s final request to the somber shot of the little group out walking onward, to whatever fate lay ahead of them. Stannis is clearly not out of the game for good. His scene with Melisandre was another one of my favorites of the episode. Stannis directs his rage at Melisandre for seemingly leading him so astray, but she succeeds in calming him down enough to keep him from choking her to death. Giving Stannis a glimpse into her world was probably the only way to keep him focused on the larger goal, and it worked. There’s a very clear sense of foreboding about the whole scene, and we’re left with the impression that the Battle of Blackwater was just the beginning of a much longer, much bloodier conflict. No Davos in sight, unfortunately, but I’m sure he’ll turn up again next season. The resolution of Daenerys’s story in Qarth contains a lot of interesting elements, but I can’t help but feel that it’s one of the weaker parts of the finale. Dany’s visions in the House of the Undying resulted in some great imagery, most notably the sight of the throne room at King’s Landing all broken down and covered in snow, seemingly abandoned and forgotten. Dany’s brief reunion with Drogo and her unborn son left me cold, but your mileage may vary. Dragon fire is definitely cool, but the resolution to the conflict seemed overly simplistic, in that it basically came down to “my magic beats your magic”. I am glad to see that Daenerys and her band of followers (which is larger than I thought it was, after that slaughter earlier in the season) will finally be heading to Westeros. That’s sure been a long time coming. And I still like Jorah quite a bit (even if he is a bit blinded by love). But I’m continuing to like Daenerys less and less. Did anyone else think that the punishment of her chambermaid was a bit excessive? I know, it’s a more primitive society, and this type of tribal justice is much more of an accepted, everyday thing, but this really isn’t doing much for the idea that Daenerys would make a good leader. Where’s that “gentle heart” that Jorah is always talking about? If you ask me, Daenerys is turning into just another mad Targaryen. Just imagine how bad it would be for a mad Targaryen to have a bunch of dragons at her command. I’m still not warming up to Jon Snow as much as I’d like, but it’s a completely different situation than with Daenarys. Jon is a decent enough individual, with no serious moral infractions on his slate. I just hate that he still seems so poorly developed and blandly acted. Kit Harrington seems to be at his best whenever Jon isn’t just being pushed around by everything and everyone around him, and actually makes his own decisions. But too much of the time he just stands around with that blank look on his face, waiting for things to happen to him. Hopefully being forced to kill Qhorin in order to survive will be a step toward a more proactive Jon Snow with a stronger identity and sense of direction. As a protagonist, he’s just too aimless and vacant for me so far, though I am still very interested in where his story is going at the moment. “Game of Thrones” has been a slow build from the very start, taking its merry time in doling out the bigger picture. The wait can be maddening, but I’d still happily take more and longer episodes per season for telling the story. (Although, that might lower the budget per episode to an unacceptable level.) It’s satisfying to see the show inching closer and closer to so much of what has been only hinted at and suggested until now. I had some minor issues with the episode, but the overall execution is, as usual, strong enough to make me overlook these flaws. And the final scene, not surprisingly, probably played the biggest role in raising my final opinion of the episode. It goes without saying, but it’s going to be a long wait until season 3. Based on comments made by fans of the books, it’s going to be a spectacular season.